If George magazine was about “not just politics as usual,” a day at the office with John F. Kennedy Jr. was not just business as usual. John handpicked creative director Matt Berman to bring his vision for a new political magazine to life. 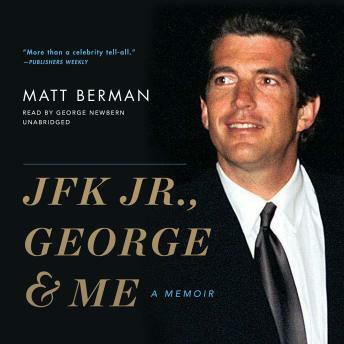 Through marathon nights leading up to George’s launch; extraordinary meetings with such celebrities as Barbra Streisand, Robert De Niro, and Demi Moore; and jokes at each other’s expense, Matt developed a wonderfully collaborative and fun-loving relationship with America’s favorite son. They were an unlikely team: the poised, charismatic scion of a beloved political family and the shy, self-deprecating artistic kid. Yet they became close friends and confidants. In this warm, funny, and intimate book, Matt remembers his brilliant friend and colleague—John’s approach to work, life, and fame, and most of all, his ease and grace, which charmed those around him. More than any book before it, JFK Jr., George, & Me reveals the friendly, witty, down-to-earth guy the paparazzi could never capture. Matt opens the doors of John’s messy office to share previously untold stories, personal notes, and never-before-seen photos from the trenches of a start-up magazine that was the brainchild of a superstar. John helped Matt navigate a world filled with celebrities, artists, beauty, style, competition, and stunningly tender egos. In turn, Matt shares the invaluable lessons about business and life that he learned from John. What emerges is a portrait of JFK Jr. as a true friend and mentor.